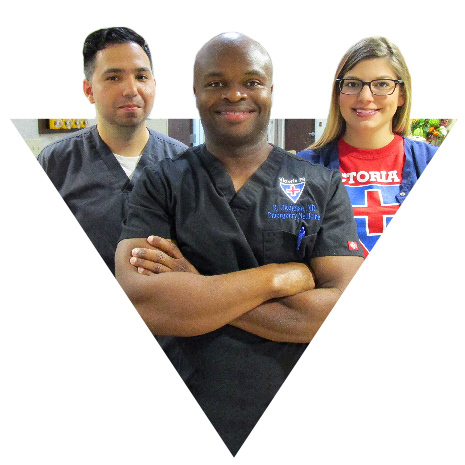 Victoria ER is here for the community, providing adult & pediatric emergency care, quickly and compassionately. Without the wait of an over-crowded hospital emergency room, Victoria ER offers short wait times in a comfortable, inviting waiting room designed to deliver the most pleasant patient experience possible. NO APPOINTMENT IS NEEDED. WE ARE OPEN 365 DAYS A YEAR! To get a quote for care, come in today for a free basic medical screening. We can diagnosis and treat everything from the common cold to serious, life-threatening illnesses, accidents, and injuries. Victoria ER has state-of-the-art imaging & lab capabilities. This includes top quality X-rays and ultrasounds, and on-site lab results. We provide the best care possible to our patients that meets their needs within the full context of their lives. Our board-certified physicians and pediatric specialists are experienced in diagnosing and treating infants, toddlers, and children. "Went there today, and everyone was so nice and caring, from reception, all the way through the entire staff. I have never had such nice and caring staff at any of the hospitals. Dr Narang has a great bedside manner and one of the most caring and calming emergency doctor I have ever been seen by."